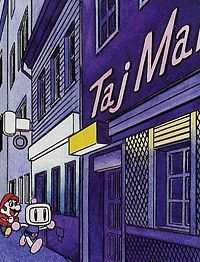 Taj Mahal is a restaurant in Frankfurt, Germany, that appeared in the Club Nintendo comic "Sag niemals Holerö!". It marked an important stop-over in the story which is about Mario, Bomberman and TicToc attempting to stop an evil alien called KKDU from invading Earth. A Toad called Todojewski recommended the Taj Mahal to the friends, claiming that they would find out more about KKDU and his plans there. Arriving at the restaurant (they found it only by accident), all they find inside is a maze made of filing cabinets. They manage to get through the maze and stumble upon Mahgo, a man who tells the friends about secret powers each of them have. Afterward, they leave the restaurant. The Taj Mahal is named after a famous Indian mausoleum. When Todojewski recommended to get to the Taj Mahal, Mario first thought they had to go to India. This page was last edited on March 26, 2018, at 06:55.